During the First World War a young man was sent to the Isle of Man to be interned for the duration of the war, at Knockaloe, being a foreign national who had lived in England since 1912. This man was Joseph Pilates who had been a sickly child and discovered that exercise was the key to gained physical and emotional strength. He was a gymnast, a yoga enthusiast and had earned a living as a professional boxer, circus trainer and had been a self-defence trainer at police schools. Whilst on the Isle of Man Pilates used his time effectively, as did many of the other internees at the Knockaloe camp did. The Leece Museum at Peel and archive evidence at the library at the Manx Museum show how prolific and industrious these prisoners of war were. Pilates for his part began to develop his concept of an integrated, comprehensive system of physical exercise, which he himself called ‘Contrology’. He trained his fellow inmates and it is suggested that this exercise regime played a large part in the survival of inmates during the TB pandemic of 1918. At the end of the war Pilates returned to Germany but was soon dissolution by the political and social conditions and ultimately settled in America where he married his wife Clara and worked extensively in the development of his technique which he continued to call ‘Contrology’, the use of the mind to control muscles. The exercises focused attention on the core postural muscles that help keep the human body balanced and provide support for the spine. He encourages awareness of the breath and the alignment of the spine, and the strengthening of the deep torso and abdominal muscles. He died at the age of 84 in 1967 and his legacy continues today in the form of Pilates. Pilates was considered ahead of his time. His exercises are now taught around the world and are popularised and endorsed by celebrity status. Madonna, Darcey Bussell, Simon Callow to name a few. Although some of the exercises have been modified to encompass modern thinking towards exercise, the principles of relaxation, concentration, alignment, breathing, centring, co-ordination, flowing movements and stamina continue today. It is therefore fitting and deserving of the memory and influence that Joseph Pilates has on the fitness industry that ‘Contrology’ has returned to the west of the Island. Pilates is once more offering health and fitness benefits to those wishing to take part in weekly mat based classes. Much of the literature Pilates produced emphasised that these exercises can be performed by all and that the methods and exercises have relevance to anyone who wants to improve their physical fitness and to deal with various postural conditions that particularly affects us in the 21st Century. These mat based classes are being taught by Elizabeth Main, certified Pilate’s teacher and Level 3 Personal Trainer. Elizabeth provides all the equipment required, including small apparatus and works closely with the clients to provide a range of exercises to give a general all over body conditioning programme which encompasses flexion, extension, rotation, core stability, abdominal strength, openness and co-ordination. The classes concentrate on technique and understanding, working from a beginner level to progress on to more advance range of movements. Clients are encouraged to book their place in advance through Elizabeth. Private instruction, and one-to-one training also available at Elizabeth’s private studio in the heart of the tranquil Patrick village. 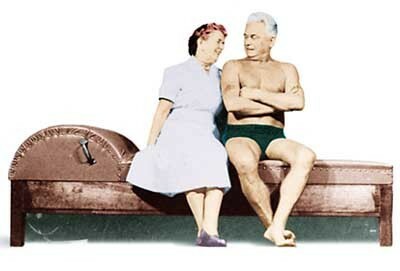 Joseph Pilates would have been proud to realise that his passion and enthusiasm for the benefits of exercise are continuing today in the shadow of his temporary home. Come and join us to find out how your life could too change and feel the inner strength that Pilates can give.